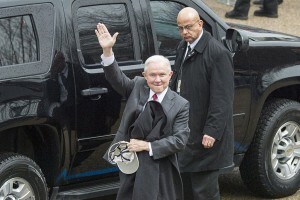 Attorney General Jeff Sessions and Colorado Republican Senator Corey Gardner went toe to toe over legal marijuana in Colorado on January 10, 2018. The Attorney General has been threatening a federal crackdown on legalized marijuana for some time now, and the Republican Senator, among politicians from both sides of the aisle, takes issue with the Attorney General’s stance. CBS Denver interviewed Adam Orens, Founder of Marijuana Policy Group, about the effect a crackdown might have on Colorado, whose system of handling legalized marijuana is a model for other states and major cities across the U.S. that are learning how to regulate legalized marijuana. Orens states that a federal crackdown could affect the willingness of investors interested in getting involved in the industry, for fear of what increased federal scrutiny could mean to their profits. Senator Gardner has vowed to continue to block all DOJ nominees from confirmation until the Attorney General Sessions abandons his efforts on marijuana enforcement. Gardner stated that Sessions assured him marijuana would not become a priority once he was confirmed by the Senate, but that has not been the case. Gardner released a statement in which he reiterated that he believed individual states’ rights were being infringed on through the Attorney General’s actions. Even with the Department of Justice returning its focus to criminal prosecution of marijuana, more states are pressing toward legalization. Orens stated he did not believe legalization would be slowed down at all, and that states would continue to move forward with their individual efforts to legalize, despite recent events. The Senate is currently considering drafting language into the pending appropriations bill to ban the use of federal funds to penalize retail marijuana outlets in states that have passed laws allowing it. During the Obama administration in 2013, a directive known as the Cole memo was issued to federal prosecutors, instructing them to use their prosecutorial discretion not to place priority on prosecuting legitimate marijuana dispensaries and retail outlets in states where cannabis is legalized, but rather to focus on illicit enterprises that sold drugs to children, released marijuana into the black market, operate with criminal gangs, or sell marijuana across state lines. However, the Attorney General’s policy change rescinded that directive. If the Department of Justice holds firm and does not change course on this issue, Congress may have to act to protect states with marijuana laws on the books, by banning the use of federal funds going toward enforcement. This issue is likely to polarize both Democrats and Republicans who favor ending the federal prohibition on marijuana and leaving the question to each state. According to Newsweek, at least a dozen states are poised to consider marijuana legalization this year. The Executive Director for the National Organization for the Reform of Marijuana Laws stated that he believed the momentum behind marijuana law reform will not only continue but increase as 2018 progresses. With the latest Gallup poll showing 64 percent of American adults favoring legalization of marijuana (including a majority of Republicans), this year could be a game changer.